(top row) Kenny Mandell, Skerik, Marina Christopher, Erik Hanson, Evan Woodle, Haley Freedlund. Photo by Daniel Sheehan. 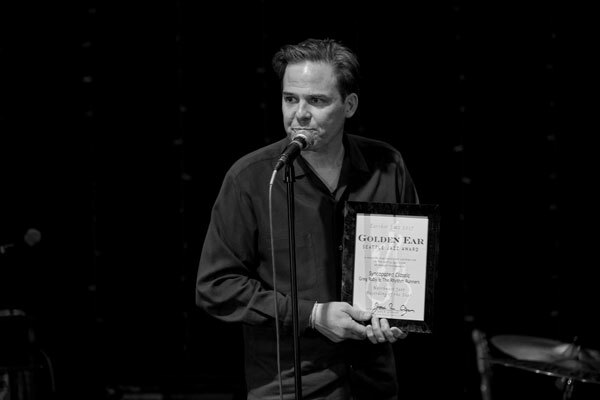 The 2017 Golden Ear Awards, celebrating the contributions and achievements in Seattle jazz, were presented at The Royal Room on April 2, 2018. The Delvon Lamarr Organ Trio (Delvon Lamarr on Hammond B3 organ, Jimmy James on guitar, David McGraw on drums) opened the evening, and jazz radio broadcaster Jim Wilke emceed the award ceremony. Each year, the Golden Ear awards give jazz fans an opportunity to vote for the outstanding musicians, community members and events of the previous year. A call for nominations goes out in January, with a public ballot then distributed by the Earshot Jazz website and publication. 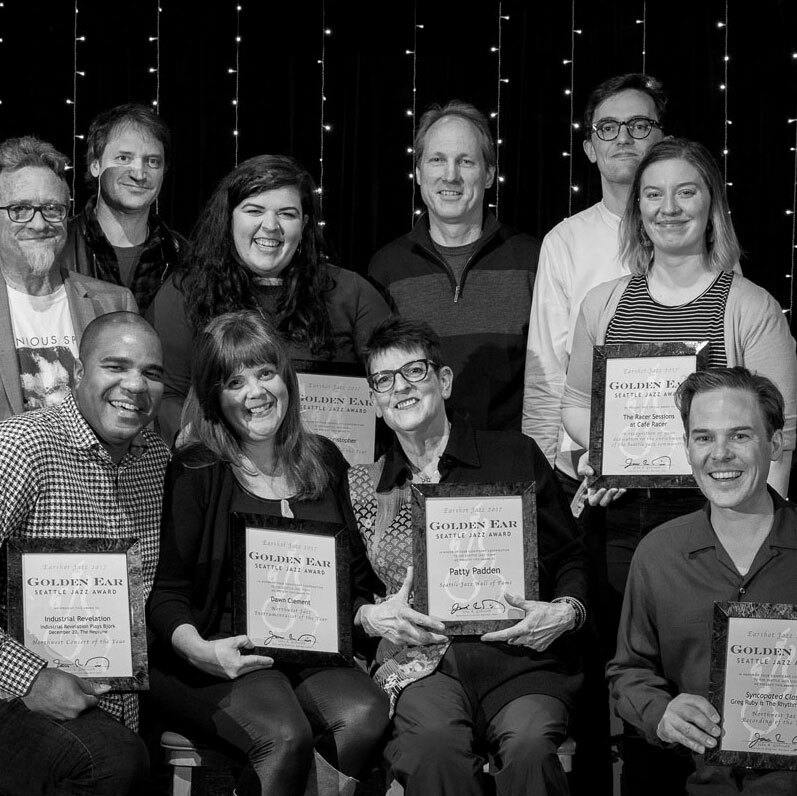 We congratulate all the nominees in this annual look at the region’s vibrant jazz ecology, and thank you, Golden Ear voters, for your participation in recognizing and celebrating all of the incredible talent in the Northwest. 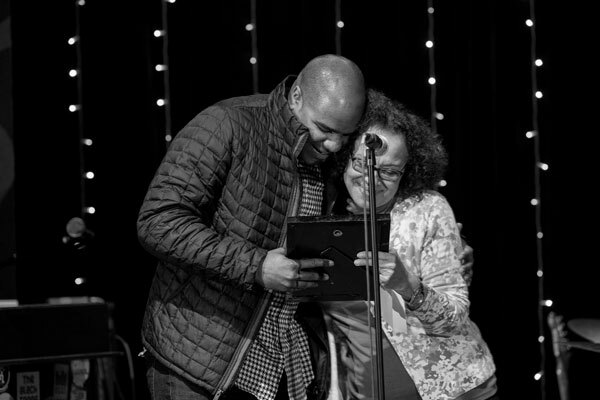 Industrial Revelation founder and drummer D’Vonne Lewis accepts the award for Concert of the Year from Board member Ruby Love. Photo by Daniel Sheehan. 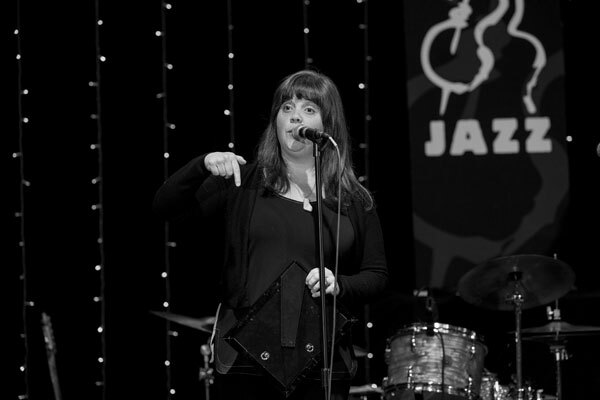 “If I could cut this out and pass it to all the nominees I would,” said Dawn Clement as she accepted the award for Instrumentalist of the Year. Photo by Daniel Sheehan. 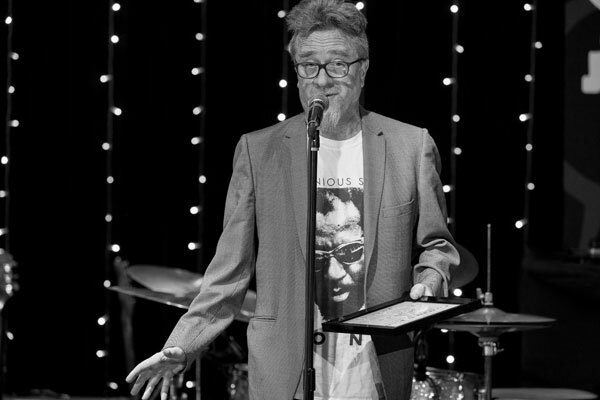 Greg Ruby of Greg Ruby and the Rhythm Runners accepts the award for Northwest Recording of the Year. Photo by Daniel Sheehan. 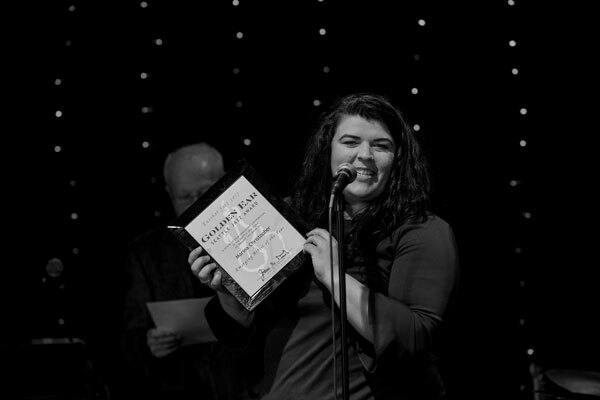 Bassist and Vocalist Marina Christopher accepts the award for Emerging Artist of the Year. Photo by Daniel Sheehan. 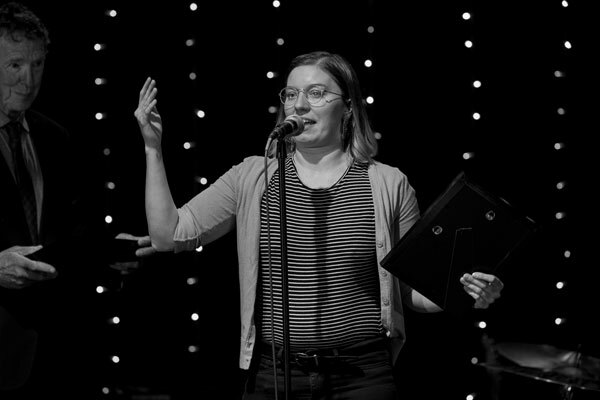 Haley Freedlund accepts a special award on behalf of Racer Sessions at Café Racer. Photo by Daniel Sheehan. Kenny Mandell accepts a special award for his work with Couth Buzzard. Photo by Daniel Sheehan. 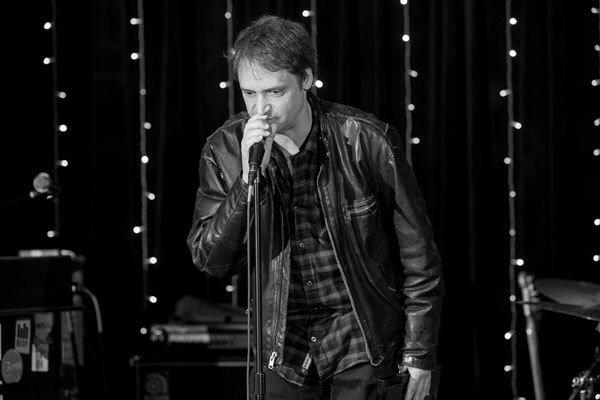 Skerik accepts his award for Jazz Hall of Fame after a moving induction speech by Wayne Horvitz. Photo by Daniel Sheehan. 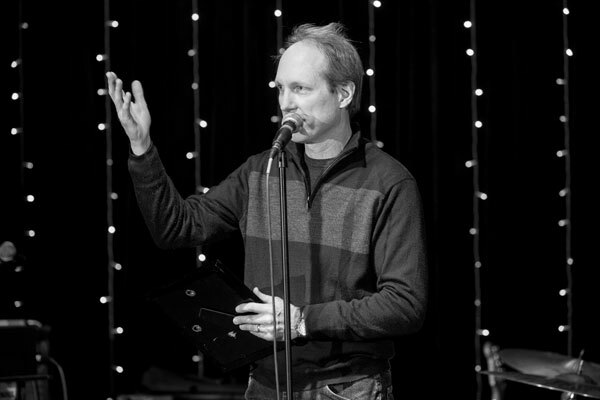 Erik Hanson accepting a special award for his work with Jazz Night School. Photo by Daniel Sheehan. 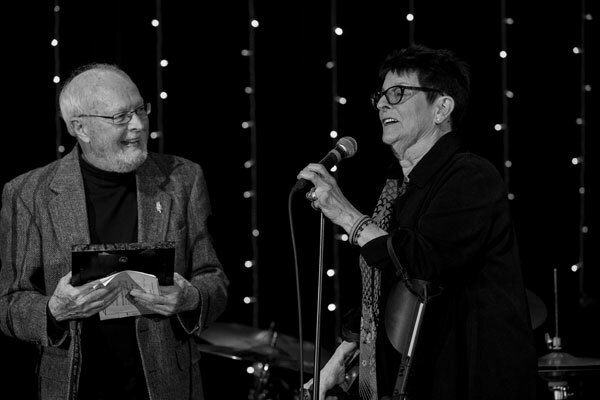 Jazz drummer Patty Padden on being inducted into the Jazz Hall of Fame by Jim Wilke, “This is a pleasant surprise. Sometimes surprises aren’t so pleasant.” Photo by Daniel Sheehan. Have someone you’d like to nominate for the next Golden Ear Awards?